Diana Luna is a junior music major at SFA from Gladewater, Texas. She is also a transfer student from Kilgore College and received her Associates of Arts. She currently performs in the Lumberjack Marching Band at SFA. During her time at Kilgore College, she performed in the marching band, concert band, and the jazz band. While attending Gladewater High School she competed in All-Region, All-Area, and State Solo and Ensemble. She plans to teach middle school and high school bands but would like to teach elementary music classes also. She chose SFA because it has been her dream school since freshman year of high school. One of Diana’s favorite things about studying trombone at SFA is getting to listen to everyone perform in the trombone studio. James Hall is a sophomore music education major at SFA from Malakoff, Texas. He currently performs in the SFA Symphonic Band and the Lumberjack Marching Band. He attended Malakoff High School where he was low brass section leader his last three years. Kyle Manuel is a senior music education major at SFA from Cypress. He is currently a member of the wind ensemble, the Swingin’ Axes, the Lumberjack Marching Band, and a trombone quartet. During the summers, Kyle plays with the Good Shepherd United Methodists Church orchestra. Kyle went to Cypress Ranch High School where he worked as a section leader and later head brass, and also got the opportunity to play at the Music for All/Bands of America convention. Kyle plans to become a band director after his undergrad while pursuing his masters in music theory. Some of his favorite moments at SFA include marching in the Macy’s Thanksgiving Day Parade, the Ireland St. Patrick’s Day Parade, and any concert with the jazz band. Evan Linscombe is a freshman Music Education major at SFA from West Columbia, Texas. He currently performs in the symphonic band and trombone choir. He attended Columbia High school where he went to all-state solo and ensemble for two years and received many honors including the title of drum major his last year. Upon graduation, Evan hopes to live his passion of teaching and performing music. 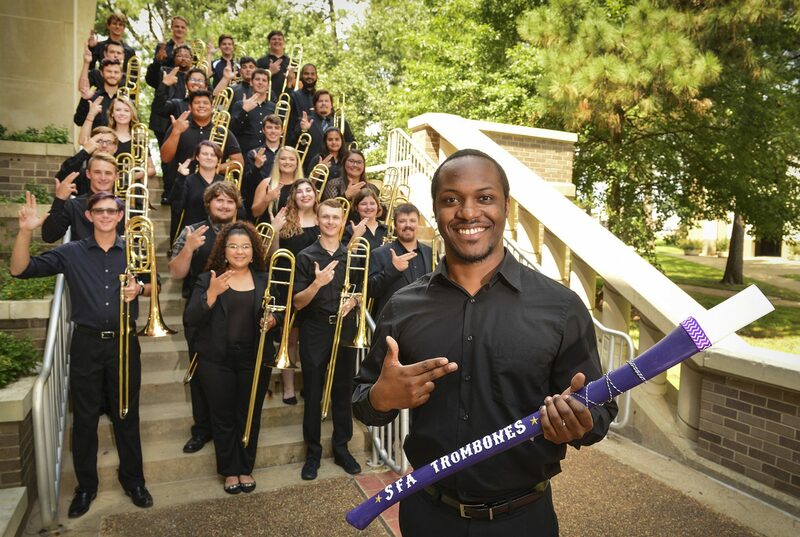 His favorite thing about studying trombone at SFA is the friends he has made and the experiences he gets to cherish. Chris Cannon is a senior music education major from Carrollton, Texas. He is the principle trombonist of the SFA Wind Symphony, as well as a member of the Roaring’ Buzzsaws Pep band. He has performed with the Lumberjack Marching Band for 3 years, participating in the Macy’s Thanksgiving Day Parade in New York City, and the St. Patricks Day Parade in Dublin, Ireland. During the summer Chris gave private lessons to high school students and was a summer band clinician for Blalack Middle School in Carrrollton, Texas. He plans to get his degree in Music Education and become a band director in north Texas. Chris says that one of the greatest things about coming to SFA is the opportunities to perform in many different ensembles and even take those talented groups across the world. Joe is a freshman music major from Bridge City, Texas. He currently performs with the SFA Wind Ensemble, Orchestra of the Pines, the Swingin Axes jazz band, the Lumberjack Marching Band, and the Roaring Buzzsaw Pep Band. During the summer he performed in a production of Grease with the Beaumont Community Players. Joe attended Bridge City High School and performed in the 5A All-state band as 1st chair bass trombonist (2018), sang as a bass in the SSC Mixed Choir (2017) and earned outstanding soloist at state solo and ensemble as a vocalist (2018). His favorite thing about SFA is how friendly and welcoming everyone in the music program has been. Hannah Renfrow is a junior music education major from Huffman, Texas. She performs with The Lumberjack Marching Band, Wind Symphony, and SFA Brass ensemble. She also works the SFA band camps, and is the treasurer of Kappa Kappa Psi, a music service fraternity. Hannah hopes to be a middle school and high school band director, and to later pursue a masters degree in music theory. Jacob Samford is a junior music education major from Tenaha Texas. He has been in the Wind Symphony, Symphonic band, Swingin’ Axes and Aces, The Lumberjack Marching Band, and Trombone Choir. He attended high school at Tenaha ISD where he was an ATSSB All-State trombonist for two years, as well as making state solo and ensemble. His favorite thing about being a music major is how nice and helpful the faculty are to students personal lives, as well as their professional careers. Patrick Johnson is a third-year music education major from Katy, Texas. He is a member of the SFA Wind Ensemble, Orchestra of the Pines, and the SFA trombone Quartet. Early last summer he was invited to play alongside the Longview Symphony Orchestra in their outreach program in Longview ISD. He is from Mayde Creek High School, where he was a section leader for the Mighty Ram Band and was also presented with the John Philip Sousa Award. His future plans include becoming a high school director back in his hometown, as well as continuing his studies in trombone pedagogy. His favorite thing about Nacogdoches is spending his time with his friends and faculty, as well as playing in the Roarin’ Buzzsaws pep band. Jeremiah Armstrong is a sophomore education major from West Columbia Texas. He has been a member of the Lumberjack Marching Band, SFA Trombone Choir, Concert Band and Wind Symphony through the university. Outside of college, he participates in Drum Corps during the summer (Guardians 17’ & Bluecoats 18’). He attended West Columbia High School and participated in ATSSB region and state solo and ensemble as well as serving as the drum major. He plans on being a high school band director and eventually go on to graduate school for a masters in conducting. LizVette Rivera is a senior Elementary music education major at SFA from Santa Fe, TX. She currently performs with the SFA Wind Ensemble, Nac Winds, and SFA Brass Ensemble. She attended Santa Fe High School where she was also a part of their wind ensemble. While in high school, LizVette performed in the Macy’s Thanksgiving Day Parade, Good Morning America morning show, and Grammy Camp in Los Angeles, California. Her favorite thing about studying trombone at SFA is the friendships she has made in the studio along with the challenge of being the best she can be every day. Kristen Mercer is a freshman music education major at SFA from Spring, Texas. She currently performs in the Lumberjack Marching Band. She attended Oak Ridge High School in Conroe, Texas where she served as one of the band historians for three years. She loves the peaceful atmosphere of Nacogdoches and the sense of camaraderie among the trombone studio and the marching band. Upon graduation, she plans to attend graduate studies in Music Theory. Bryan Moore is a freshman music education major at SFA from Hallsville, Texas. He currently performs in the Lumberjack Marching Band, and SFA’S Trombone Choir. He attended Hallsville High School where he was loading crew captain and band vice president and received many honors including the Band Director Award. Upon graduation, he plans to attend SFA to earn a Masters in Education or Composition. His favorite thing about coming to SFA and playing trombone is that he gets the opportunity to carry out his grandma’s legacy and make new lasting friends throughout his time at SFA.